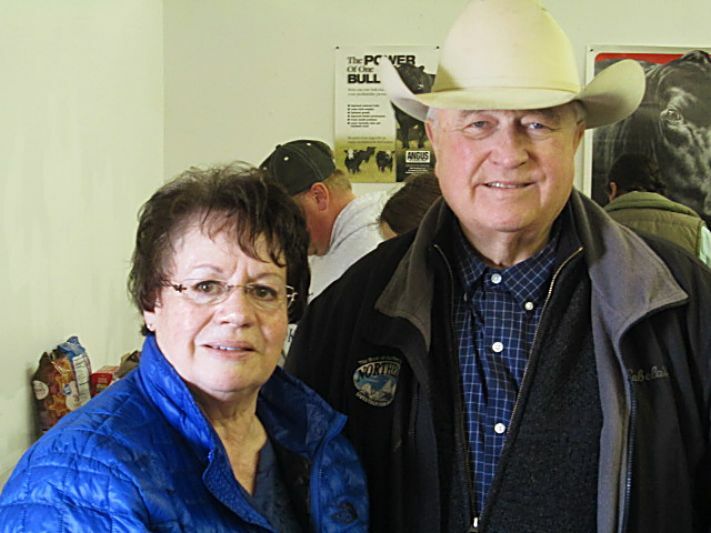 Fred and Gwen Wacker of Cross 4 Ranch in Miles City, Montana. The Lund's B Bar Angus sale was held on a beautiful, Saturday, March 23, 2019 at the Bull Palace in Baker, MT. There sure was a lot of snow left to melt and soak into the ground to make good green pastures this spring around the Baker area. Steve, Melanie, Ethel, Rob & Kara Lund Families brought a balanced top notch group of bulls to their Annual Sale. A good crowd gathered early to enjoy a delicious roast beef dinner with a buffet of home baked goodies. Lot 121 at $13,000, B BAR RIGHTEOUS 1218, DOB 2/27/18, REG#19134428, B BAR RIGHTEOUS 76 x B BAR KEM 121, sold to Echo Valley, Scranton, North Dakota. Lot 97 at $8,250, B BAR CONVICTION 0978, DOB 3/9/18, REG#19134425, B BAR CONVICTION 066 x B BAR EULIMA 970, sold to Charles Tennis, Vale, South Dakota. Lot 508 at $8,000, B BAR BLACK MASS 5088, DOB 3/20/18, REG#19134463, B BAR BLACK MASS 3045 x B BAR QUEEN ZARA 508, sold to Littau Angus Ranch, Winner, South Dakota. Lot 413 at $7,500, B BAR RIGHTEOUS 4138, DOB 3/3/18, REG#19134453, B BAR RIGHTEOUS x B BAR LADY JEWEL 413, sold to Echo Valley, Scranton, North Dakota. Lot 672 at $7500, B BAR WINDY 7 6728, DOB 2/17/18, REG#19134477, B BAR WINDY 79 x B BAR QUEEN 672, sold to Powder River Ranch, Arvada, Wyoming. Lot 239 at $7500, B BAR CONVICTION 2398, DOB 3/10/19, REG#19134438, B BAR CONVICTION 066 x B BAR QUEEN 239, sold to Charles Tennis, Vale, South Dakota.